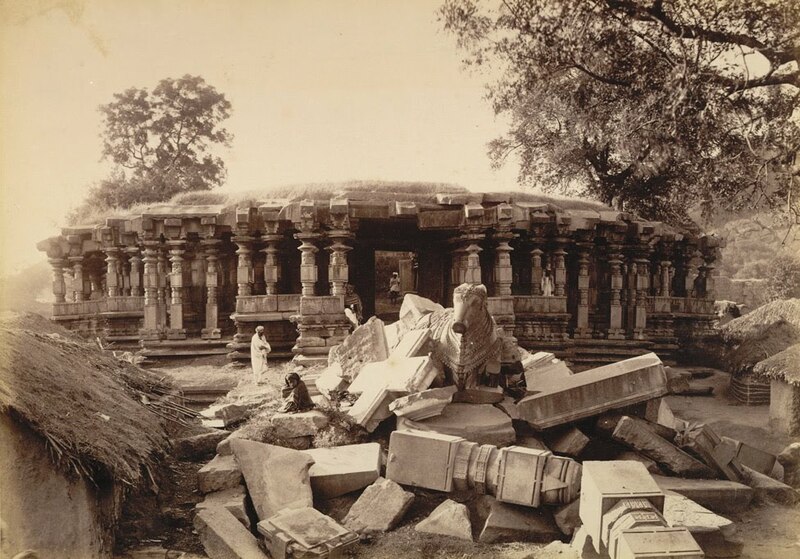 Photograph of the Thousand Pillared Temple, at Hanumkonda in Andhra Pradesh, taken by Deen Dayal in the 1880s. This is from the Curzon Collection: 'Views of HH the Nizam's Dominions, Hyderabad, Deccan, 1892'. Hanamkonda or Hanumakonda, near Warangal, was one of the capitals of the Kakatiya rulers in the 12th-13th centuries. The two cities were important political and artistic centres of the eastern Deccan. The Shiva temple seen in this view was built by king Rudradeva in 1163 and takes its name from another ruined mandapa with numerous columns of granite. It consists of three shrines dedicated to Shiva, Vishnu and Surya that are preceded by a columned mandapa or hall with a porch. The outer wall have moulded basements and wall niches, which have now lost their sculptures, covered by miniature temple towers. The shrines have lost their superstructures. The mandapa has sharply cut columns with multi-faceted shafts. This view shows the sculpture of Nandi, the bull mount of Shiva, that was once placed in front of the temple.